Latin Nights back at Sirena! - San Diego Dining Dish! Latin Nights back at Sirena! I know that next week is San Diego Restaurant Week, but if you would like to go out and have a more specialized experience, Sirena Gourmet Latin Seafood Restaurant is heating up Little Italy once again with its second ever “Latin Nights” dining series! On September 24th, guests can indulge in a south-of-the-border adventure in Little Italy as Sirena and Executive Chef, Jaime Chavez, welcome another renowned chef to showcase the best flavors of Latin America. 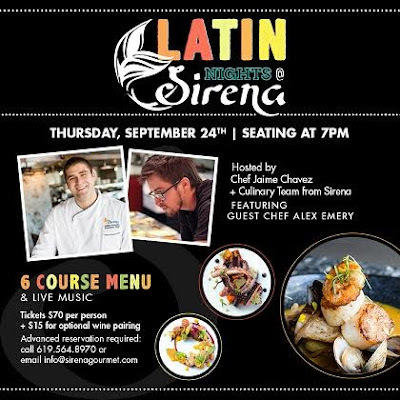 Although every Latin Night is different, highlighting the chef’s specialization in a specific Latin American cuisine, diners can always expect a lively interactive experience with a unique six-course meal that will excite every taste bud. Starting at 7:00 p.m., Hilton San Diego Bayfront’s Banquet Chef, Alex Emery, will prepare adventurous Southern California cuisine influenced by strong Latin flavors. With a passion for playing with contrasts, Chef Alex packs each bite with bursting sweet and spicy fusions. Inspired by a wide range of Latin spices, each palatable course will be optionally paired with luscious wines from Argentina, Chile and the Valle de Guadalupe. Guests will be engulfed in the culture as live Latin music complements the bold flavors of each six-course dish. Each ticket costs $70 with an additional $15 for an optional wine pairing. Seating will begin promptly at 7:00 p.m. Spots are limited and advanced reservations are required by calling 619.564.8970 or emailing info@sirenagourmet.com.